The Sea Gladiator Mk I is a Rank I (country and aircraft type) with a battle rating of 1.3 (AB/RB/SB). It was introduced in Update 1.49 "Weapons of Victory". The Sea Gladiator Mk. 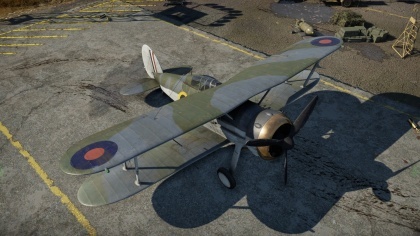 I is the last of the Fleet Air Arm biplane naval fighters and, as the name suggests, is a naval modification of the regular Gladiator seen in the RAF tech tree. As a result, its handling characteristics are very similar to said plane type. 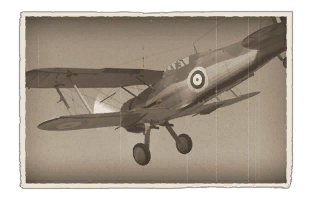 At Rank I and a battle rating of 1.3, this plane will typically be one of the first fighters a new player will research. However, the Sea Gladiator, like its land-based cousin, may be difficult to seek success in, especially in Realistic Battles mode. 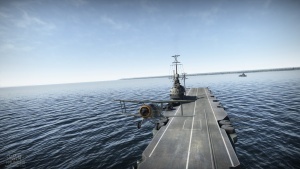 Within RB, when up-tiering comes into play, it will have to deal with not only biplane adversaries such as the CR.42, F3F and the very manoeuvrable Ki-10, but also more advanced fighters such as the P-40E, Bf 109s, I-16s, and Ki-43s. All these plane types have several varying advantages against the Sea Gladiator, which can make early grinding a bit unbearable for some players. Its power plant configuration, which includes a engine with no WEP capability and a three-blade fixed-pitch propeller, can make the Gladiator a slug in acceleration and climb. 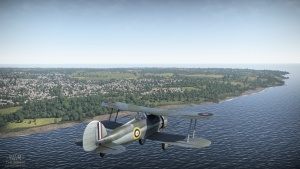 In flight testing the Gladiator can usually only sustain at most around 3,000 fpm (roughly 15 m/s) in a climb at around 180-200 km/h (111-124 mph) indicated airspeed, and its top speed isn't great either (at sea level it can only manage around 335 km/h, and testing has yielded 396 km/h at 4,000 m altitude). The Sea Gladiator manoeuvres well. However, it bleeds a lot of speed in sharp turns, and while its turn radius is good enough to shake off reserve planes, the loss of speed can make the plane a slower and henceforth more vulnerable target to any other enemy planes in the area. Using flaps does help a bit with decreasing the amount of speed lost in a turn, but it is not beneficial enough to allow for minimal loss of speed. And like most early British fighters, it hates high speeds in dives. However, the Sea Gladiator has four 7.7 mm (.303) Browning machine guns with a total of 2,000 rounds on hand. The Gladiator's four Browning armament can come in handy at times - when equipped with tracer belts, the plane is capable of taking down even the fiercest of opponents if you play your cards right. A good approach to combat is to attempt to side climb as much as you can on any given map, then use your altitude advantage and turn advantage wisely. The Sea Gladiator is outclassed by most of the fighters it comes across. It is inferior in manoeuvrability to the F3F, I-16 and Ki-43, in speed to the 109s, P-40 and CR.42, and in armament to the Bf 109E-3 and P-40E. The Gloster Sea Gladiator was, as the name suggests, a naval modification of the Gladiator biplane fighter in use by the Royal Air Force (RAF). Ninety-eight Sea Gladiators were completed: 38 "interim" airframes modified from the existing Gladiator Mk II production line (serial numbers N2265 – N2302), and 60 purpose-built airframes (serial numbers N5500 – N5549 and N5565 – N5574); differences from the Gladiator Mk IIs in service with the RAF included the planes being fitted with catapult attachment points and a tail hook, the airframe being strengthened to withstand carrier landings, and a dinghy lifeboat being made mountable to the underbelly of the plane. As with the Gladiator Mk II it was based off, the Sea Gladiator was powered by a nine-cylinder Bristol Mercury VIIA radial engine rated at 840 hp and mated to a three-blade Fairey metal fixed pitch propeller, and armed with four 7.7-millimeter (.303) Browning machine guns. 54 Sea Gladiators were still in service with the Fleet Air Arm by the time Britain declared war on Germany in September 1939. Sea Gladiators saw service in the Atlantic aboard Royal Navy carriers, and in the Mediterranean theater during the Siege of Malta. This page was last edited on 2 February 2019, at 21:58.